The latest offering from Kwaito and Hip Hop writer-musician Mx Blouse is a bold music video from their new single No Match, released at the end of 2018. Sandi(x)Blouse’s debut EP Believe in Bloom, released in 2017, was a melting pot of different genres, owing to their eclectic taste in music mainly Kwaito and Hip Hop. “For this track specifically, as with my rap style as a whole, I look to iconic kwaito stars who never took lyricism for granted. I’m talking about the likes of Mapaputsi, TKZee and others”, explained Blouse. M(x)Blouse behind the scenes of latest music video No Match. 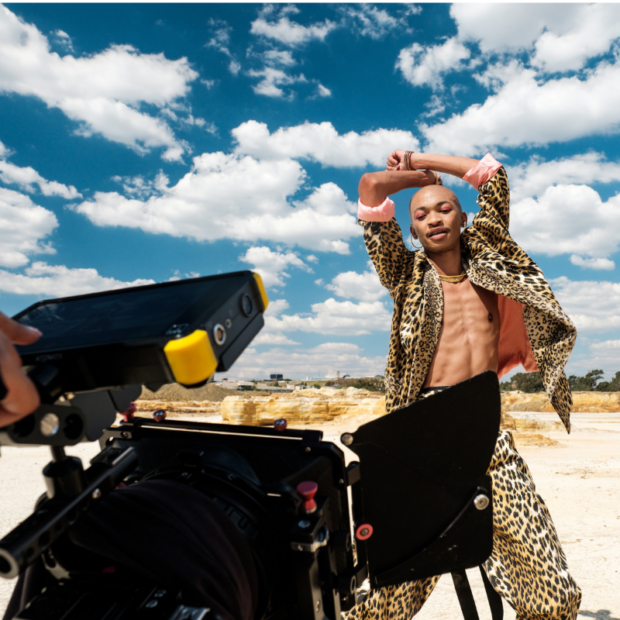 Directed by Keitumetse Qhali (Direct Kit), M(x)Blouse’s No Match music video is aesthetically speaking, both unapologetically brazen and soft; staying true to how they have expressed themselves as a non-gender conforming artist and activist in a highly male-dominated industry. The narrative is one that tells of a love gone wrong, taking accountability in the aftermath and eventually letting go. Paying homage to their unapologetic sense of style, Blouse wears designs by Marianne Fassler and Nao Serati. See the exciting visuals below.